Enviro-Vac have the resources and infrastructure in place to provide safe, efficient and sensible solutions to any hazardous materials abatement project. Our national reach and many long-standing strategic partnerships provide our clients a range of complimentary services that can work seamlessly with our hazardous materials abatement teams to offer a total solution. A company's philosophy relating to managing contingent risks, especially in an operation such as hazardous materials abatement, can be quite indicative of the caliber and capabilities of that firm. We provide excellent insurance coverage tailored specifically to the type of projects our clients need. All workers are insured through Workers Compensation coverage. Enviro-Vac consistently meet the highest safety, regulatory and insurance requirements, through rigorous safety auditing. Due to our unprecedented safety record and strong history of financial stability, we can provide some of the strongest and most well-respected insurance and bonding coverage in the entire industry. By dedicating significant resources to our policies and process regarding implementation and administration of our insurance program, we are able to professionally address risks in the form of risk management. Regulators place an explicit duty on owners and employers to do their “due diligence” in regards to risk management at their facilities or job sites. The OH&S legislation across Canada gives employers and work site owners duties and responsibilities for their own directly hired workers as well as for the workers of other contractors. Although this is accomplished in different ways in each province, the same result follows. Some jurisdictions, such as the Yukon, Nova Scotia and Ontario, expressly define "employer" to mean a person who employs one or more workers or who contracts for the services of one or more workers, to perform work or supply services. Enviro-Vac has taken the additional steps to acquire contract performance bonding. This offers our clients the additional assurance that Enviro-Vac will complete their work. In order to qualify for performance bonding, Enviro-Vac must adhere to stringent criteria of the bonding company with respect to our financial operating condition and guarantee of directors. Enviro-Vac is capable of providing bid bonds and performance bonds; as well as, labour and material payment bonds for the plethora of work we undertake. Enviro-Vac is also required to post performance bonds when requested, and commendably maintain an excellent track record with its insurance & bonding company. The cost of bonding for environmental work is typically requested by the clients, as an assurance that work undertaken can be completed. Enviro-Vac is highly regarded and valued surety of AXA Pacific Insurance. Enviro-Vac are pre-qualified through various global screening networks, which provide some of the most comprehensive contractor database and management tools available on the Canadian market. 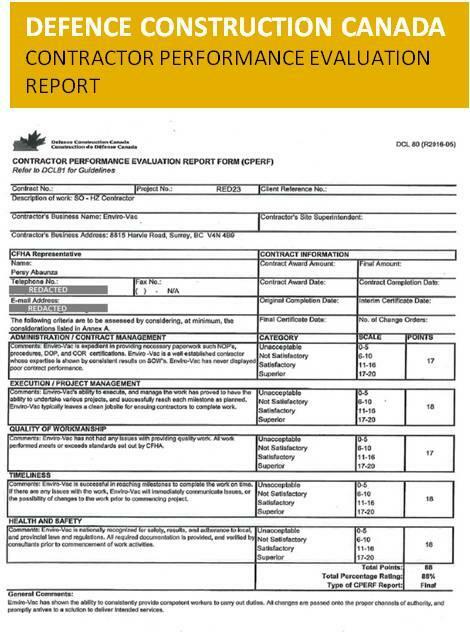 Enviro-Vac scored a total of 88 points (88%) earning us a superior rating for our work with Defense Construction Canada. Click the image to read our Contractor Performance Evaluation Report and see how we scored for Contract Management, Project Management, Quality of Workmanship, Timeliness, Health and Safety and more.